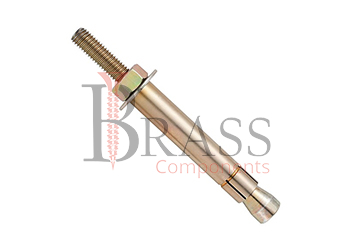 Undercut Anchors are made from Carbon Steel, Stainless Steel, Free Cutting Brass, Leaded Brass, 301 Stainless Steel or Aluminium Which are passivated and tested to ASTM and other International Standards. Undercut Anchors are available in standard ASTM A 36 steel, high strength ASTM A 193 Grade B7 steel and Type 316 stainless steel in Class 1 and Class 2 strength designations. They are available in any metric or imperial sizes as per Custom Specification. Undercut Anchors guarantees maximum safety in concrete, brick system and provide positive connection. Undercut Anchors are externally threaded anchors. Standard range of Undercut Anchors are available for environmental Indoor and dry conditions. Available with close spacing and small edge distance. Corrosion Resistance and Vibration Resistance. Undercut anchors combine the advantages of post-installed mechanical anchor. Provides flexibility and immediate loading. Self-Undercutting facilitates fast and reliable installation without the need for a separate undercutting tool. Designed for predictable ductile steel performance. For structural connections, beam and column anchorage. Provide secure hold in cracked concrete under dynamic loading. Provide Safety-Relevant, Heavy-duty fastening for all dynamic loading in cracked or uncracked concrete, including applications in nuclear power plants. Undercut Anchors for standard pre-set installations and for through bolt applications. For structural connection, beam and column anchorage, tension zone application, pipe support, heavy duty loading and suspended equipment. We manufacture Undercut Anchors as per Custom Specification and export in Germany, Spain, Netherlands, Portugal, UK and other European Countries. For more Information, Please Contact Us or Inquiry Now.